"This is amazingly sweet and way too tempting to resist!" Mix cake mix and 2 eggs together in a bowl. Add butter and vanilla extract; mix until batter is smooth and thick. Spread batter into the prepared baking dish. Beat confectioners' sugar, cream cheese, and 2 eggs together in a bowl until smooth; spread over batter. Bake in the preheated oven until sides of cake are pulled away from dish and browned, 25 to 35 minutes. Cool cake completely. 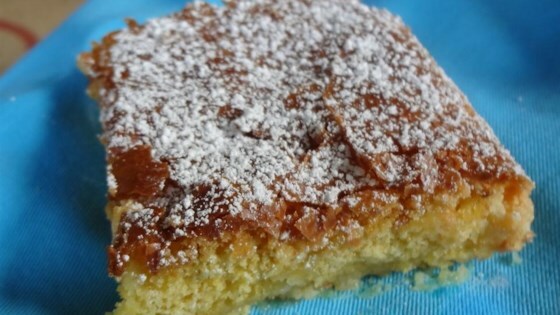 Sprinkle more confectioners' sugar over cooled cake. I LOVE a sweet dessert, but this is super super sweet as written. Ill make it again, but will cut way back on the powdered sugar. I followed the recipe to the tee. It turned out absolutely delicious. The only thing I will say is that mine rose a little more than I've traditionally seen. Nonetheless, wonderful! Made it for the first time tonite for tomorrows office potluck and had to taste it... you know, for quality assurance. I think I just had an out of body experience.